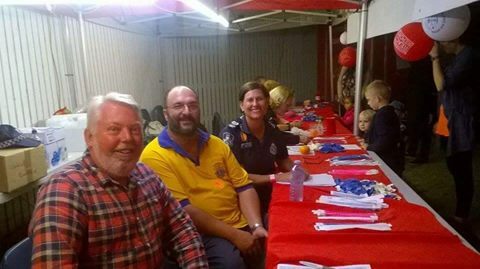 Townsville Cleveland Bay Lions Club, is a proud supporter of the Kidz Alert Safety Program, run by the Queensland Police Service and The Daniel Morcombe Foundation. The staff and volunteers working on the Kidz Alert stand at major events deliver a safety message to every child who visits the stand. They also issue each child with a colourful wristband which identifies them if they were to get separated from their loved ones. So How Does Kidz Id Work? Registration is free and only takes a couple of minutes of your time for priceless peace of mind. Visit one of the kidz alert stands which will be situated at all of the entrances. Complete a registration form which will require a full description of the child that you are registering including clothing and the contact details of a parent or guardian who they are with at the show. Present the form at the Kidz ID Alert stand and a member of staff will check it, deliver a safety message to your child and issue a wristband. Enjoy the event with the peace of mind that your child will be quickly reunited with you in the event that they wander off. With the Townsville Show over for yet another year, we were happy to see so many of our amazing Members are out in force helping keep the kids (and some adults) safe by helping out the Qld Police Service and Daniel Morcombe Foundation at the Kidz Alert stand. For more information about the Daniel Morcombe Foundation, please follow the link.